Our Parish Priest is Archpriest Peter Smith. Father Peter is a graduate of Holy Cross Greek Orthodox School of Theology in Brookline, MA. Prior to attending seminary Fr. Peter was a deacon in the Orthodox Church for nearly five years. He was ordained to the holy priesthood during seminary, after which he continud his studies while assisting at a local parish. Following graduation from seminary, Fr. Peter and his young family were transferred to Montreal, Canada, where he served as Assistant Pastor of St. Nicholas Orthodox Church. His first assignment as parish priest was in 2000, when he was assigned to the pastorate of St. George Orthodox Church, Vicksburg, MS. After four years as priest of St. George, in 2004 Fr. Peter was assigned to the pastorate of St. Mary Orthodox Church in Wichita, KS, which he served for nearly six years. Fr. Peter was made the Pastor of Saint Sophia Orthodox Church in 2009, and he and his family have lived in the greater Austin area since that time. Both Fr. Peter and Presvytera Collette are converts to Holy Orthodoxy (from Protestantism and Roman Catholicism) and as such are sensitive to the questions, confusion and concerns of those coming out of different faith traditions who may be approaching the Orthodox Faith for the first time. Bishop Basil was born in Monessen, PA on November 26, 1948, the only son and eldest of three children of William and Genevieve Essey (ﻋـﻴـﺴـﻰ). He was baptized on April 17, 1949 at St. Spyridon Greek Orthodox Church in Monessen and raised at St. Michael Antiochian Orthodox Church in Monessen. His Grace received his primary and secondary education in the public schools of Monessen, and in 1970 he received his B.A. in Psychology from California State University of Pennsylvania in California, PA. He entered St. Vladimir’s Orthodox Theological Seminary in Crestwood, NY in 1970, from which he received his M.Div. in 1973 and, in 2010, was awarded a D.D. honoris causa. From 1973 until 1975 Bishop Basil served as pastoral assistant at St. George Church in Detroit, MI and from 1975 until 1986 he served as the first director of the Archdiocese’s Department of Youth Affairs with offices at the main chancery of the Antiochian Orthodox Christian Archdiocese of North America in Englewood, NJ. While working in that capacity, he served as instructor of Contemporary Byzantine Chant at St. Vladimir’s Seminary from 1980 until 1986; in 2010 the Seminary's Board of Trustees established the Bishop Basil Program in Byzantine Liturgical Music, a concentrated course of study in Byzantine chant. During 1986 and 1987 he resided at the St. John of Damascus Patriarchal Institute of Theology at the Balamand Monastery of the Dormition in the al-Koura region of north Lebanon where he studied, taught and did research and translations for The Liturgikon: The Book of Divine Services for the Priest and Deacon which was published by the Archdiocese’s Antakya Press in 1989 (reprinted in 1994 and 2010). Bishop Basil was tonsured a reader by the late Metropolitan Antony (Bashir) at St Michael Church in Monessen on October 27, 1964, and ordained to the subdiaconate and diaconate by Metropolitan Philip (Saliba) at St Ignatius of Antioch Church at the Antiochian Village in Bolivar, PA on September 30, 1979. On January 27, 1980 he was ordained to the priesthood by Metropolitan Philip at St Anthony Church in Bergenfield, NJ and on October 9, 1988 was elevated to the dignity of archimandrite by Metropolitan Philip at St George Church in Wichita, KS. From July 1, 1987 until his consecration to the episcopacy in 1992, he served as priest at St. George Church in Wichita, KS. During his pastorate the new church temple was erected, consecrated and elevated to the status of Cathedral on April 21, 1991. He received monastic tonsure to the Lesser Schema at the Patriarchal Stavropegic Monastery of St. John the Baptist in Tolleshunt Knight by Maldon, Essex, England, during the night between January 19 and 20, 2003 by the monastery’s abbot, Archimandrite Kyrill. His Grace was nominated for bishop (Auxiliary to Metropolitan Philip) by the General Assembly of the Antiochian Orthodox Christian Archdiocese of North America on July 26, 1991, and was elected to the episcopacy (with the titular see of Enfeh al-Koura in north Lebanon) by the Holy Synod of the Greek Orthodox Patriarchate of the Great City-of-God Antioch and all the East on November 14, 1991. He was consecrated to the episcopacy on May 31, 1992 at St George Cathedral in Wichita, KS by Metropolitan Philip of the Archdiocese of North America, Metropolitan Elias (Audi) of the Archdiocese of Beirut, Bishop Antoun (Khouri) titular bishop of Seleucia and auxiliary of the Archdiocese of North America, and the late Archbishop Michael (Shaheen) of Toledo, OH, Auxiliary of the Archdiocese of North America. From 1992 until 1995 he resided at the Los Angeles Chancery, and in September 1995 he took up residence at the Wichita Chancery. 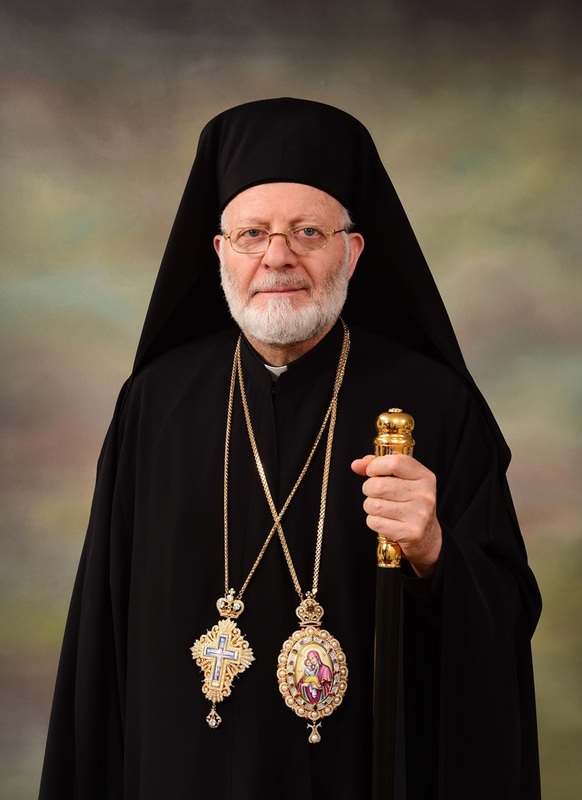 By a decision of the Holy Synod of the Patriarchate dated October 9, 2003, His Grace became a diocesan bishop and, since his enthronement on December 15, 2004, bears the title of Bishop of Wichita and the Diocese of Mid-America. Bishop Basil co-chaired the Joint OCA-Antiochian Canonization Commission which led to the glorification of Bishop Raphael (Hawaweeny) of Brooklyn on May 29, 2000. His Grace oversaw the publication of the book containing St. Raphael’s Vita, Akolouthia and Akathist (Antakya Press 2000), arranged the hymnography for St. Raphael to Byzantine melodies, and directed the Clergy Brotherhood Choir which recorded an audio CD of the hymns for the feast of St. Raphael (Antakya Press 2001). In November 2002 His Grace headed the delegation from the Archdiocese of North America which met in Geneva, Switzerland with the delegation from the Patriarchate of Antioch to reach agreement on the basic principles of Self-Rule for the Archdiocese of North America. 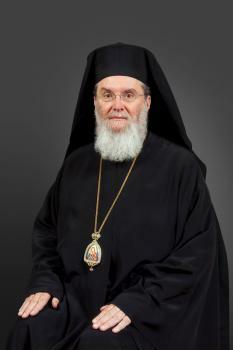 In May 2010 he was elected Secretary of the Assembly of the Canonical Orthodox Bishops of North and Central America. His Grace, The Right Reverend Bishop Basil, now resides at the Chancery of the Diocese of Wichita and Mid-America located at 1559 North Woodlawn Boulevard, Wichita, KS 67208-2429. The Diocesan Cathedral of St. George is located at 7515 East 13th Street at Broadmoor, Wichita, KS 67206-1223. His Eminence Metropolitan JOSEPH was consecrated to the Holy Episcopacy on June 30, 1991 at St. Mary Cathedral in Damascus, after many years of serving as a deacon and priest. His Eminence was born in Damascus, Syria, in 1950. He completed his basic schooling at the St. John of Damascus and al-Assiyeh schools in Damascus and then at Our Lady of Balamand Monastery in Koura, Lebanon. He completed his undergraduate studies at the Lebanese University in Beirut and then earned his Master of Theology (M.Th.) with special studies in music and languages from Aristotle University in Thessaloniki, Greece. He was awarded an honorary Doctor of Divinity degree from St. Tikhon Orthodox Seminary in South Canaan, Pennsylvania in May, 2010.